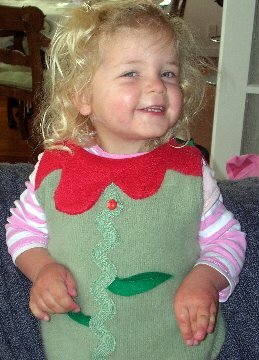 ... dressing ones youngest (and already adorable) daughter in a homemade recycled sweater top that makes her look like a flower may SEEM like a great idea. It does however, take quite a bit longer to do the shopping. of course you got comments!! oooooooo, she looks soooooooo cute!!!!! Just found this post (laging a bit aren't I!) she looks soooo sweet! Hope you feel better soon!